For a girl that loves local produce, artisanal purveyors, design driven products and those community feels (did I mention food carts? ), Portland was everything I could ever ask for! We spent four nights in Portland based at Ace Hotel over the New Year's break. It was absolutely freezing but we found warmth and comfort in the city's friendly hospitality and incredible offerings. For me, Ace Hotel is Portland. It's located on the edge of the Pearl District and smack bang in the middle of it all. The lobby is a hive of social activity with people tapping away on Macbooks whilst sipping on Stumptown coffee. We kept going back to Clyde Common (it's just off the lobby), and it's right nearby the Alder Street food cart pod and so many great eateries. Loved the personalised touches like the locally crafted cookies with a hand written welcome note on the bed and a list of where's best to celebrate NYE. The rooms had an industrial feel, a little no frills but super comfy with big fluffy pillows and a hard (enough) bed. Attention to detail was 10/10... honour bar full of the best local brews and wines, Malin & Goetz products (like you actually want to use these!) in the shower and impeccable service. Check out my blog post here. 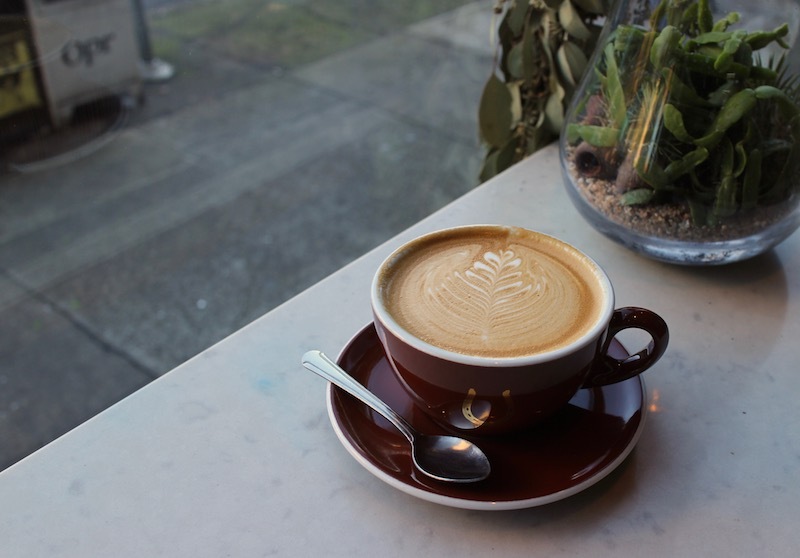 Need coffee in Portland? Stumptown Coffee is the answer. You'll find plenty of locations around the city but my favourite is right next door to the Ace Hotel. Grab a coffee, sink into the green canvas lounge and watch the world pass you by. Clyde Common is also right off Ace's lobby, but that's as hotel restaurant as this place gets. Start your day with a hot breakfast, a hit list of staples right through to more decadent offerings to slam down with a coffee. Stop in for a quick snack, biscuits with housemade jam or pull up a spot at the bar and graze on snacks. Tasty & Alder is a trailblazer in Portland's brunch scene, they've even published a cookbook 'Hello My Name is Tasty' that pays homeage to the hits. Much like Clyde Common, we kept going back to this bright and cheery corner eatery. Morning, noon, night.. it doesn't matter just make sure you are hungry. 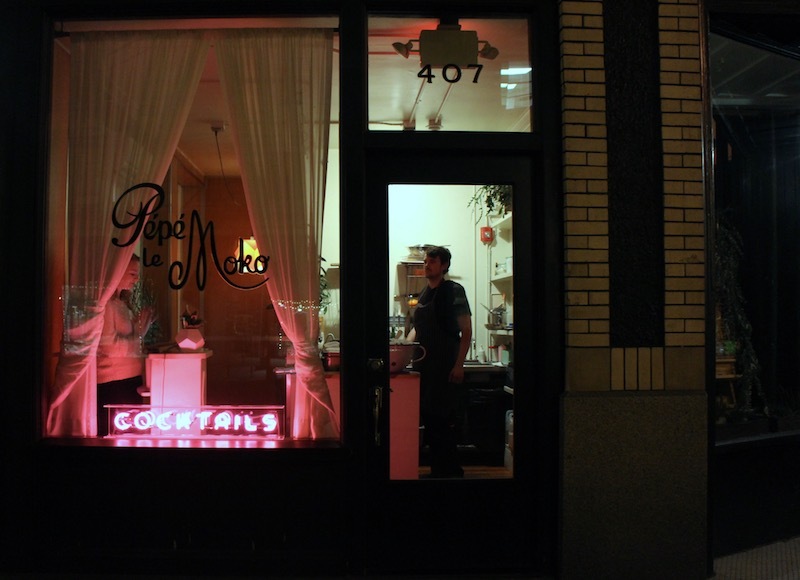 Right underneath Clyde Common is Ace Hotel's basement bar Pepe Le Moko. An intimate spot for a cocktail or two and late night nibbles. I loved our spot at the bar watching the mixers do their thing. 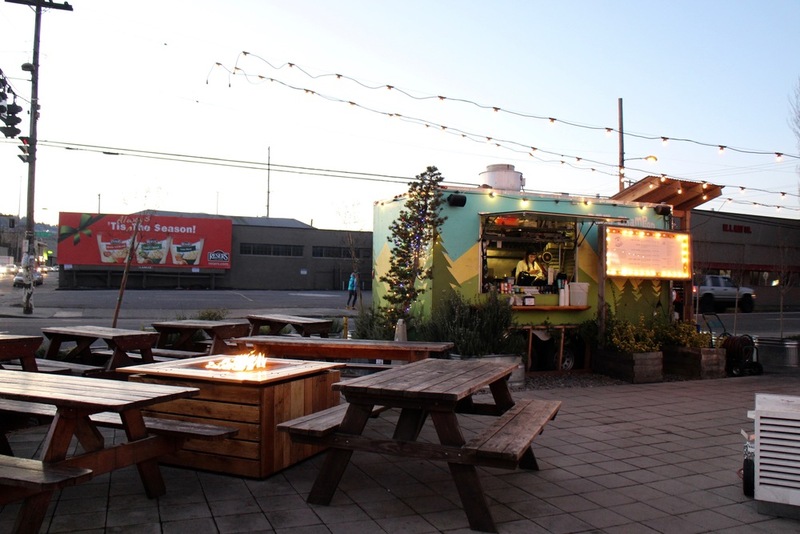 Alder Pod boasts biggest downtown collection of Portland’s food carts. Located between Southwest Alder and Washington Streets, from southwest 9th to southwest 10th Avenues. Hot favourite includes Nong's Khao Man Gai and Mac & Trees. Khao Man Gai. Hainanese chicken. Chicken and rice. Whatever you want to call it, just make sure you get there early and before the fried chicken skins sell out. Nong Poonsukwattana knows chicken rice and it is easily Portland's most popular food cart. So good you'll try and recreate it at home using Munchies recipe when those cravings kick in. Is there anything better than mac n cheese?! 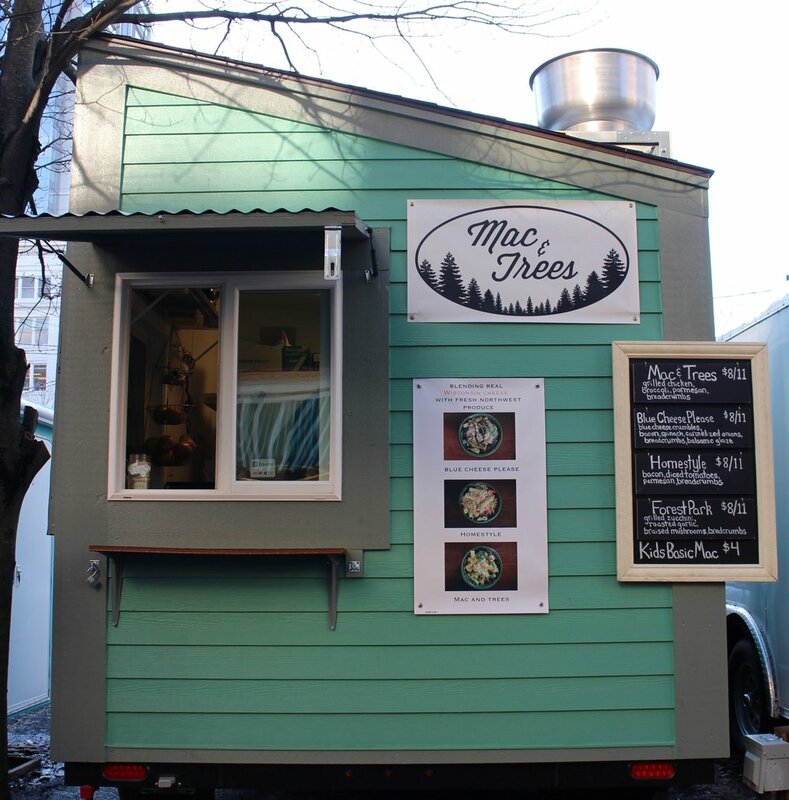 Mac & Trees has been serving up the good stuff since the summer of 2015. Choose from the specials or build your own. I've noticed they started adding vegan cheese to the menu too. Holy smokes! The donuts at Blue Star are mind blowing. The bright hued Blueberry, Bourbon & Basil glaze is a must! Made onsite using fresh blueberries, fresh basil, sugar and a splash of Bulleit bourbon. Now that I'm home wish I'd also had a Hard Apple Cider Fritter. There is a bit of hype around Voodoo, another donut joint, but a few different foodie sources said not to bother. Homely, hearty food just like Mom would make. You'll find no fuss breakfast, lunch and dinner at Mother's Bistro. You won't be blown away but sometimes a little simplicity and wholesome cooking is all you need. Portland’s late night food cart pod has some of the best. Grab some eats and gather around the fire in winter or find a spot under the marquee. Located in Cartopia is Potato Champion! A food cart dedicated to the humble spud. I would do anything to dive into another serve of the PB&J fries. 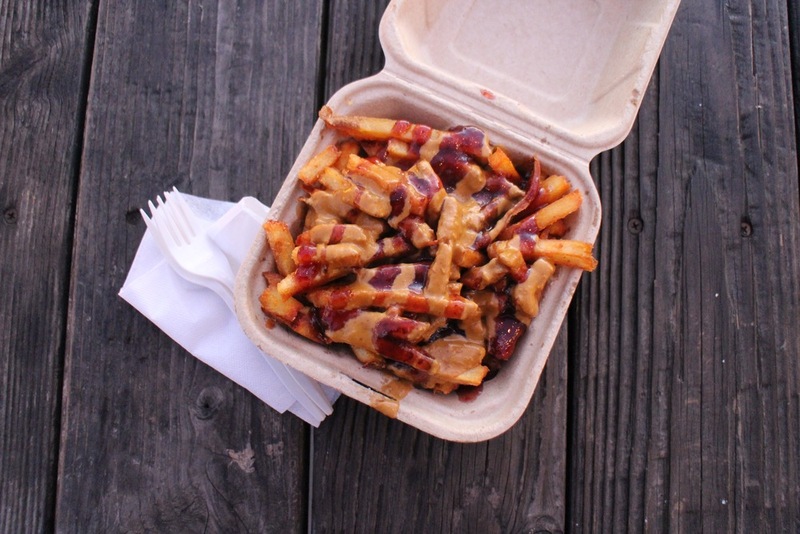 Fries topped with satay sauce and smoky chipotle raspberry goodness. Bam! *Update Jan 2017 - looks like these guys are now closed. No matter how early you head to Pok Pok, you'll still be last in line. But don't worry.. it's absolutely worth the wait! An ode to Northern Thailand street food by US chef Andy Ricker. Opening in 2005, it's the stuff of legends and cemented Division Streets row of restaurants. Order the famous Ike's wings and let staff talk you through the menu. Scoring a table at Pok Pok straight away is unlikely, wait nearby at Whiskey Soda Lounge and order yourself some soda, drinks and try the Plaa Meuk Ping (toasted dried cuttlefish). 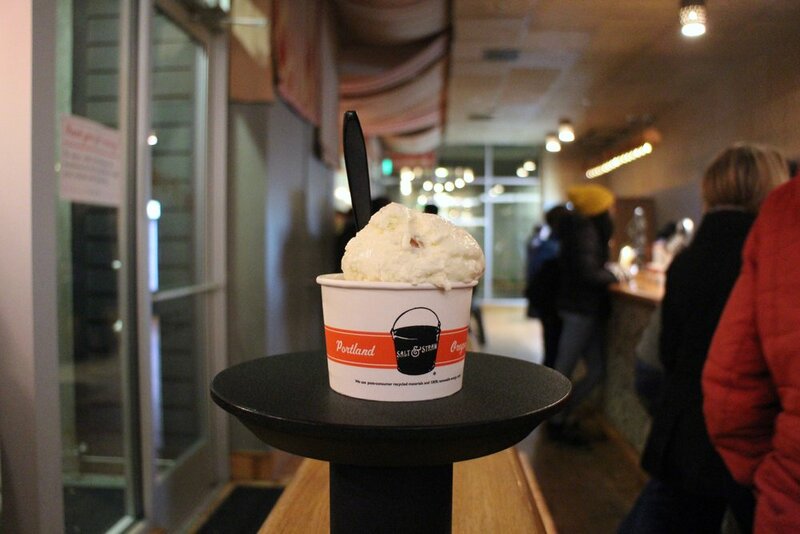 Salt & Straw is a cult artisanal ice cream shop. Focusing on local produce and seasonal flavours, the team often collaborate with like-minded purveyors. If you only limit yourself to two scoops... go for these awesome collabs Pear and Blue Cheese (w/ cheesemongers Rogue Creamery) and Arbequina Olive Oil (w/ Red Ridge Farms' Oregon Olive Mill ). 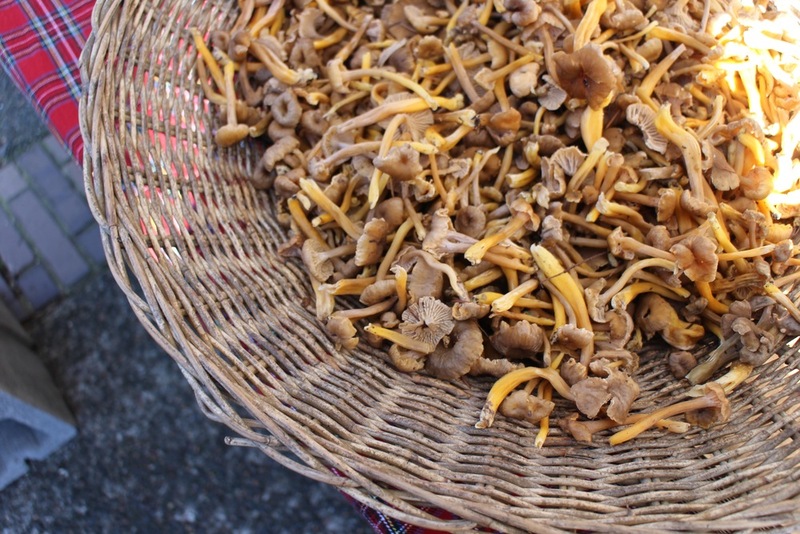 Located in the the quintessentially American surrounds of Portland's State University, the Portland Farmer's Market are open all year round. I wish we had travelled during spring or summer as the markets would have been plentiful. Go to stock up the kitchen in your AirBNB and enjoy street food from the stall holders. 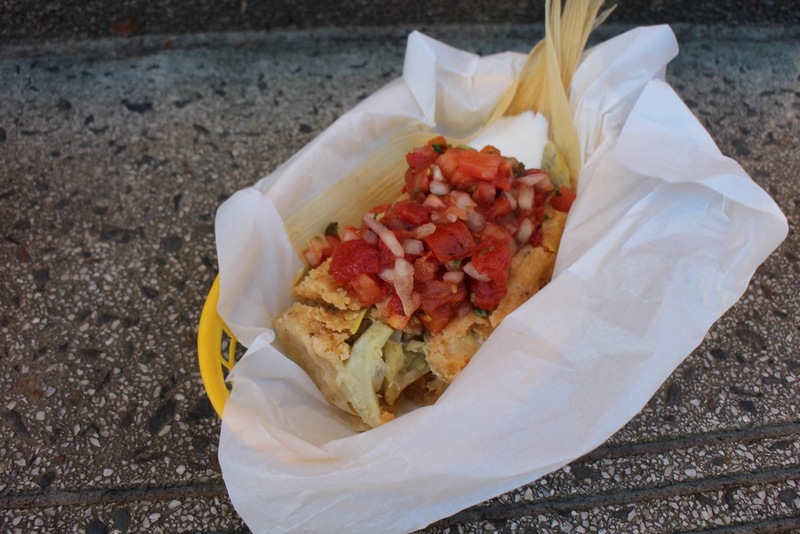 The money bowl and tamale were two of my fave eats on the whole trip, all the pics are here. Arlene Schnitzer Concert Hall and Portland Art Museum are close by and also worth checking out. Built by owner of The Oregonian newspaper Henry Pittock in 2914. Pittock's Mansion is bursting with history and remarkable stories. We were there during the Christmas holidays and every room was adorned with festive decorations. Make an afternoon of it and take in the breathtaking views of Portland. * Food truck nerds can well.. nerd out on Portland Food Carts. * Are you a glutard? So is my soul sister Andjelka. If you are into gluten free delights, wholefoods, yoga and a slower style of living you'll love her curated guide to Portland on Life Curator. * My good friends at The City Lane are building a gastronomers guide to eats around the globe and have rustled up a nifty guide for Portland (great for beer lovers!). * Citizens of the States swear by Yelp. You'll find it super handy when travelling for honest peer reviews. If you've got any questions on my Portland adventure, get in touch via comment below. There was so much to love about the Ace Hotel. A welcomed reprieve from run of the mill US hotel chains, where the dining options are lacklustre tourist traps to be avoided at all costs. Whilst Clyde Common is right off Ace's lobby, that's as hotel restaurant as this place gets. Start your day with a hot breakfast, a hit list of staples right through to more decadent offerings to slam down with a coffee. Stop in for a quick snack, biscuits with housemade jam or pull up a spot at the bar and graze on snacks. The communal tables are perfect to feast at lunch or dinner with a boisterous bunch. Make sure you make the most of Happy Hour from 3-6pm each day. Biscuits for brunch, burgers before basketball... we found ourselves heading back all hours of the day. For travellers, locals and anyone who enjoys good food with good friends. 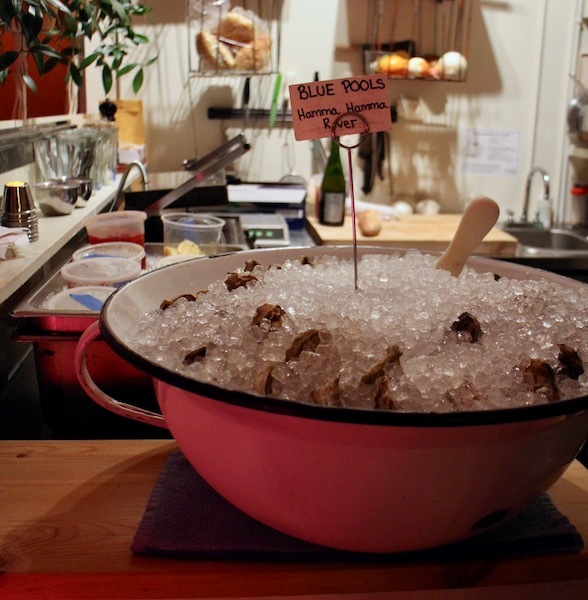 Add it to your Portland list along with Ace's basement bar Pepe de Loko. 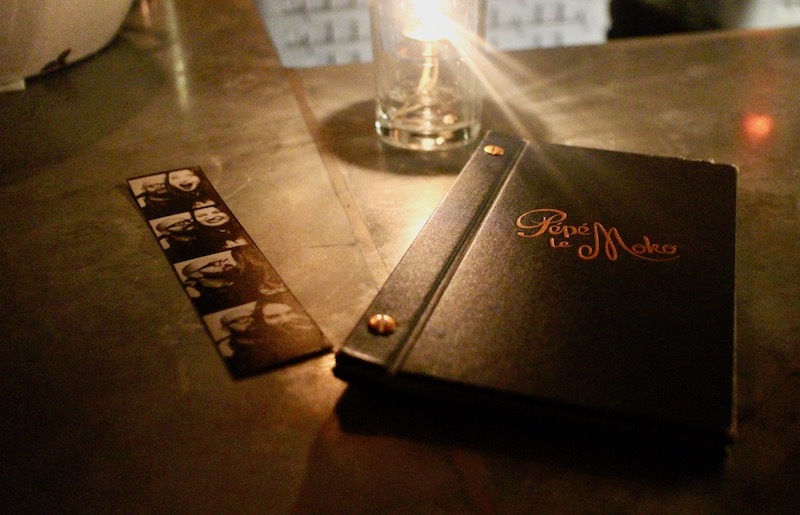 Nestled underneath Clyde Common is Ace Hotel's basement bar Pepe le Moko. Down the stairs you'll find an intimate spot for a drink or two and late night nibbles. Pull up a seat at the bar or sink into the low banquettes and while away the night over cocktails, oysters and conversation. Need coffee in Portland? Stumptown Coffee is your the answer. Strolling to the Portland Farmers Markets in the blistering cold, hoodies on and hands scrambling for warmth in pockets, had me wishing our Portland adventure was in spring. The markets would be brimming with sunflowers, brightly hued vegetables and stall after stall would be abuzz. Instead, the cold snap which brought snow the following day, had us hopping around to shake off the morning chill. The markets are open all year round. Located in the perfectly American surrounds of Portland's State University with the Arlene Schnitzer Concert Hall and Portland Art Museum close by. Whilst the stalls were a little slim, many local food vendors and artisans braved the cold to keep us warm from the inside out. Mandy King is the creator of Money Bowl, a food stall dishing up SW Chinese Remedies. A cure for the frozen with hot rice noodle bowls, Sichuan hot pot veggie bowl and sticky rice balls on the menu. Easily one of my favourite meals on our Portland trip was Money Bowl's Char Shao rice ball. BBQ pork, dried radish, woods ear mushroom and spices hidden in the centre with a Special tea egg. Only $5.50! Get your hands on hot tamales at Salvador Molly's. At the restaurant the Molly's mob delve into South American eats and pop up with steamed tamales. The artichoke and gotija cheese tamale delivered. A New Mexico style breakfast burrito was a hit at Enchanted Sun Burritos. Crammed with scrambled eggs, seasoned potatoes, NM green chile and Tillamook cheddar cheese in a warm flour tortilla with mandatory bacon or sausage. The best way to get to know a city is to get lost in it... or find its best donut store. After chasing the holey grail in Vancouver and finding Cartems, we went on the hunt in Portland. Blue Star has been going strong since 2012 and now boasts outposts in LA and Tokyo. 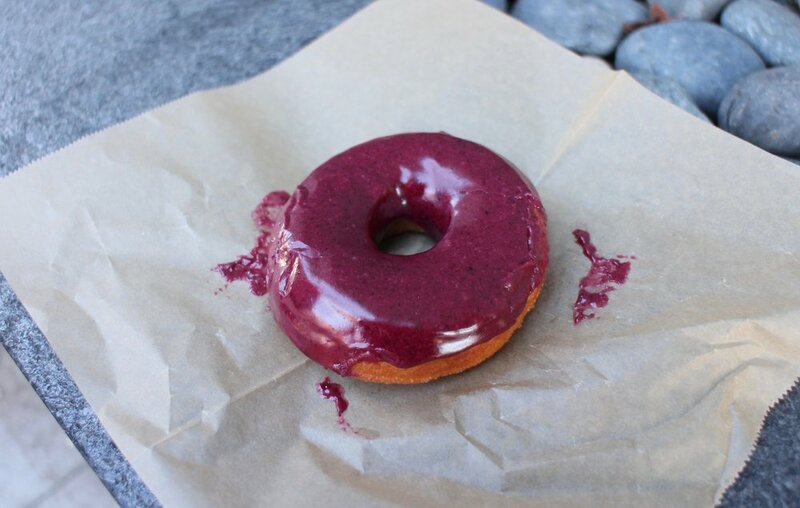 The bright hued Blueberry, Bourbon & Basil glaze is mindblowing! Made onsite using fresh blueberries, fresh basil, sugar and a splash of Bulleit bourbon. Now that I'm home wish I'd also had a Hard Apple Cider Fritter. Pok Pok is an ode to Northern Thailand street food by US chef Andy Ricker. Opening in 2005, it's the stuff of legends and cemented Division Streets row of restaurants. No matter how early you head to Pok Pok, you'll still be last in line. Worth the wait and not just so you can tick it off your Portland eats list. Go for the wings and ask the wait staff to talk you through the menu. Head across the road to Whiskey Soda Lounge whilst you wait (see below). I absolutely love this Munchies episode 'Farang', meaning foreigner, on how Ricker took a 25 year obsession and spun it into the Pok Pok empire. Enjoy! Yam Samun Phrai | Chiang Mai version of a Thai herbal salad with white turmeric, carrot, parsnip, betel leaf, basil, lime leaf, lemongrass, sawtooth, fried shallots, cashews, peanuts, sesame seeds, dry shrimp, ground pork and Thai chillies in a mild coconut milk dressing. A Chiang Mai classic - Kaeng Hang Leh | Northern Thai sweet pork belly and pork shoulder curry with ginger, palm sugar, turmeric, tamarind, Burmese curry powder and pickled garlic. Don't forget to order a drinking vinegar. Perth peeps - You can get your fix at Long Chim or find a bottle at 2nd Ave IGA. Scoring a table at Pok Pok straight away is unlikely, wait nearby at Whiskey Soda Lounge and order yourself some a soda and Plaa Meuk Ping. Ace Hotel. 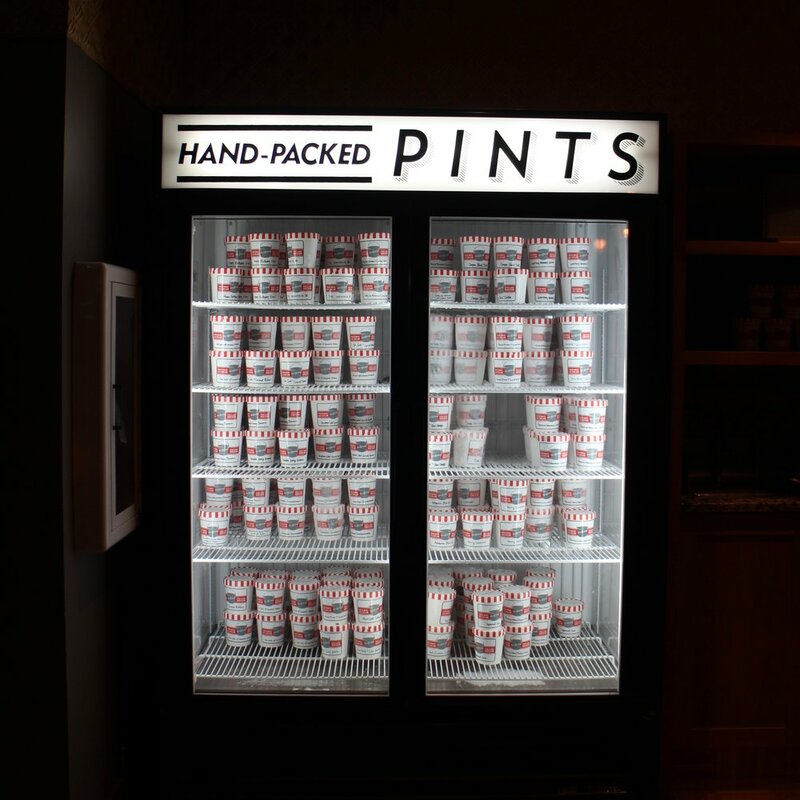 Could it be any more Portland if it tried? Good vibes, minimalist-chic decor, awesome music, hipster bikes and fierce supporters of everything local. I could go on. It even has its very own Stumptown Coffee joint! Located in the Pearl District, Ace Hotel is truly at the heart of it all. Smack bang between great coffee and its own dining room Clyde Common and cocktail bar Pepe Le Moko and only a block away from the famous Powell's bookstore and other dining haunts like Tasty & Alder and the cultish Blue Star Donuts. We stayed for four nights over the New Years break in a Standard Room at $230 USD per night. The rooms are pretty minimal, fitted out with comfortable futon-style beds and locally crafted furniture. Loved being greeted with local goodies on the bed and a personalised note. For New Year's Eve we were given a thoughtfully curated list of what was happening in the city based on what mood you were in. It was these touches that made our stay uber special. And that mini-bar choc full of local goodness was something else. The room formerly known as 215 serves up, a delicious European-style continental breakfast every morning to guests. Dive in before you start your day. I don't think I could ever stay in a corporate chain hotel again! The real highlight of Ace is definitely the communal areas. Tempting travellers outside of their rooms into the lobby. You'll find creatives tapping away on their Macbooks, exchanging stories or even just people watching. Make sure you check out the vintage black and white photobooth and get some snaps. It was always buzzing, an endless hive of activity. I cannot recommend this hotel highly enough. Trailblazing Portland's brunch scene, Tasty & Alder was created by co-owner and exec chef John Gorham. Now with a swagger of hotspots under his belt and a cookbook 'Hello My Name is Tasty' that pays homeage to the hits. We kept going back to this bright and bustling corner eatery. If you haven't downed a Mary's or two.. have you really been to brunch? Homely, hearty food just like Mom would make. Lisa Schroeder is at the helm of Mother's Bistro, a bright and cheery bistro on Stark Street. We sat at the bar and ordered a comforting breakfast with a mandatory Bloody Mary. You won't be blown away with culinary genius but sometimes a little simplicity and wholesome cooking is all you need.